Dr Steven Greer, a US former hospital medical emergency doctor, is now calling on governments worldwide to publish all withheld documents on alien visitations and UFOS.During a visit to Westminster last night he alleged to have the French government on board.He revealed for the first time what he claimed to be a genuine letter from the French ministry detailing an experiment he convinced them to take part in to make contact with extra-terrestrial beings. The medic turned Ufologist, who set up the Disclosure Project and the Center for the Study of Extraterrestrial Intelligence (CSETI), also called on London and members of the public worldwide to “rise up and change things” by demanding an end to UFO secrecy. He unveiled paperwork, which he claimed was “the most important UFO disclosure document in existence,” during a seminar in London which was also broadcast live on the internet.Dr Greer, who claims he is threatened by so-called “Men in Black” on a weekly basis, said top French MoD officials summoned an alien craft in 2010. It was confirmed on radar as passing overhead at 120,000 miles per hour. He also claimed an “alien ambassador” from the Andromeda galaxy partially materialised in front of the French leaders during the experiment on a sealed-off 220-acre estate. It had a no-fly zone above to prevent any normal aircraft passing. During his talk to a packed audience at the Cavendish Conference Venue in Westminster, Dr Greer made other bizarre allegations including: •He can summon aliens to earth for “peaceful contact” by tapping into a cosmic consciousness and ETs have developed technical craft so advanced they are living entities themselves•A secretive “illegal” organisation of corrupt global and military leaders is based underground where it actually runs the world and is desperate to withhold the truth about alien visitation to avoid the collapse of religion, the economy and world leadership. 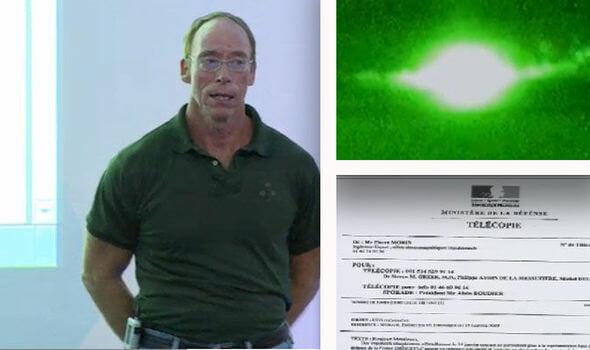 Dr Greer, who charged £50 a head to attend the conference or £26 to watch a live stream of the event, showed the audience slides of what he claimed were real aliens and UFOs caught beaming to Earth from other dimensions.He spotted them during so-called “close encounter of the fifth kind” experiences he organises.Dr Greer said inter-stellar civilisations were graded on levels of how advanced and enlightened they were from one upwards, but Earth scored zero because we keep killing each other. He said: “Our group initiates contact with people of level 300 – a bit of a gap – but once people stop lying that gap can be closed, quickly.”The French MoD contacted us, for the same reason the MoD in the US did. They wanted to know how contact made.”But, whereas he claimed “men in black thugs” frightened off mainstream US MoD officials, he said the French ignored similar threats, leading to nasty contact from the secretive officials. He made a call to arms to paranormal enthusiasts to try and make contact with aliens to get the authorities off his back. He said: “If we all do it they can’t keep tracks on us all. The real power is with all of us together, that they cannot stop, if we squeeze the toothpaste it will come out fast enough.”Dr Greer has written books and made DVDs about his claims and is currently promoting a feature-length documentary about them, available to view for a fee on his website, which also welcomes donations.Not everyone who has heard his claims are convinced by them. Debunking website Occupy Theory said after looking into his claims: “The problem that Steven Greer has is that in order to establish his own credibility, he has been forced to exaggerate. “Even his alleged conversation about UFOs with the director of the CIA was not anywhere near what everyone else at that gathering remembers and they put their memories into response letters to discredit Greer’s claims. “With zero verifiable facts and only a large number of stories that are repeatedly told…once the “facts” are tested, they don’t stand up to any scrutiny.”Dr Greer was even accused of working for the CIA by a counter-conspiracist.In a post by Alien Embryo on Unexplained-mysteries.com, he wrote: “Steven Greer is not who he claims to be, he is working for the CIA. The CIA knows people want answers and wants this technology made public. Express.co.uk has put Dr Greer’s claims to the French MoD and awaits a response.